On the palate: a hint of vanilla, aromatic spices. The finish is long with hints of orange peel. The multi-award winning Meukow VSOP Superior Cognac is well worthy of all it's medals. Adorned in some of the most prestigious competitions and tstings around the world, the incredible roundness of this cognac is thanks to the meticulous selection of eaux-de-vie within the blend. In addition, each component has been aged for at least one year long than is necessary for a traditional VSOP quality cognac. Rich, yet delicate: Mellow tannins partner with delicious aromas to make this a truly outstanding cognac for the price. Enjoy neat as the perfect digestif, or for a subtly different taste, drop in a block of ice or a splash of water. Presented in the classic Meukow bottle with the pouncing panther motif. I prefer a lighter, floral aroma. I’m beginner with Cognac and wanted to go to the next flavor up so I tried this VSOP as recommended by the retail merchant. Monnet still is my favorite so far. Will give Meukow to my boyfriend for I am certain this rough finish with mature fruit flavors will be better appreciated by him. Although I may try it again as suggested here with ice. As the name suggests, the founders of Meukow cognac originated from Russia. In 1862 two brothers were sent over to France to supply the Tsar with cognac and decided to start their own cognac distillery. 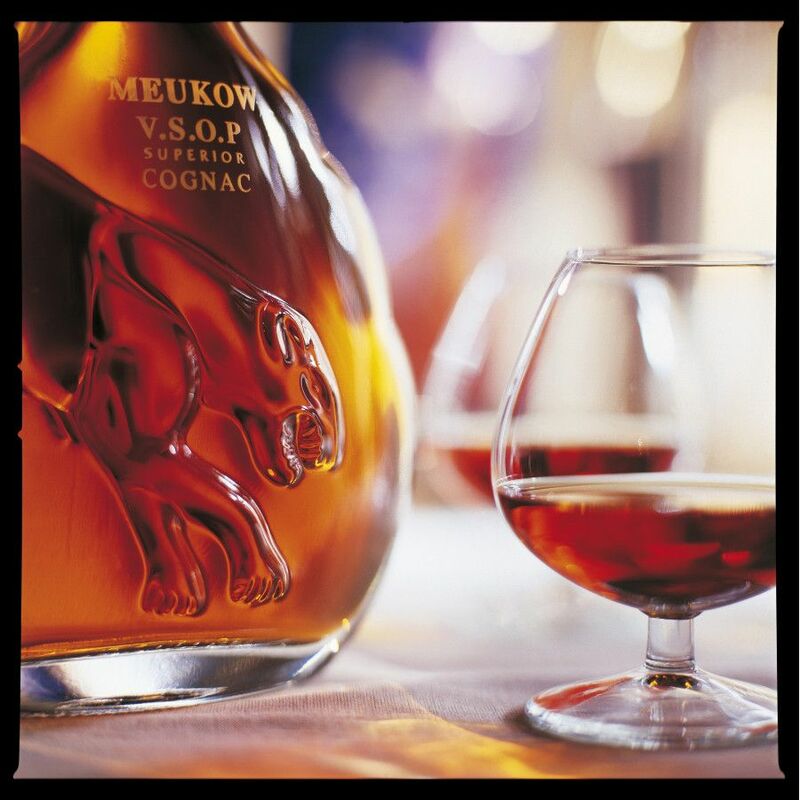 Today, Meukow, with the famous puma logo, ranks among the most well-known cognac brands in the world. Its qualities are strength, elegance, sensuality and exotism, the character traits of the puma. The distillery is housed in Matha in Charente Maritime. On the eye: A beautiful dark golden hue On the nose: Fruits and candy On the palate: Strong leather hints, rancio present. Long, lengthy finish with hints of truffle. On the eye: golden glow with flashes of amber On the nose: mature fruits, raisins, and nuts On the palate: a hint of vanilla, aromatic spices. The finish is long with hints of orange peel. Tasting review by Raymond Ragnaud: On the nose aromas of yellow fruits and flowers, yellow peaches, melon and tobacco. On the palate it's a sweet, sweet taste - vegetable grape skin notes, clove, final on spices and a very ligther musky note. An exceptional soft hints of vanilla. Sophie’s Meukow Cognac Cocktails – from California! This is a nice balanced VSOP with raisin flavour and quite long finish. I love to savour an oz of this and enjoy it for about an hour. As for my wife, she use this to cook chicken. 1 chicken drumstick, about 10 thin slices of ginger and 2 oz of Meukow. Steam it for 2-3 hours. Yummy!